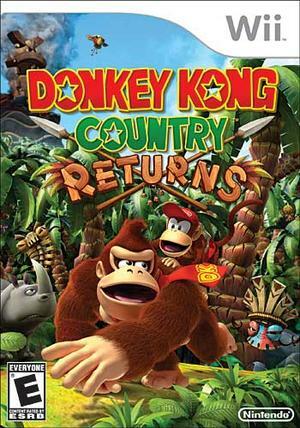 My latest article is up on PopMatters, Double Trouble: Flawed Multiplayer in Donkey Kong Country Returns. A few weeks ago I named Lara Croft and the Guardian of Light as one of my favorite games of 2010, primarily because of its excellent cooperative mode. For its benefit, it is not a platformer, which I have now decided do not lend themselves well to multiplayer experiences. That isn't to say it can't be done. Rather, it just becomes more difficult to ensure each player has an entertaining experience given the limitations of a two dimensional scrolling world. In fact, one of the reasons LittleBigPlanet can pull off cooperative play so well is its three layers of depth. I briefly knock New Super Mario Bros. Wii in the article, which I hope draws Scott's attention. We have had conversations in the past regarding NSMB's difficulty spikes and how they affect multiplayer gameplay. As I see it, Nintendo fails every time someone feels they might as well not play and allow just one person to overcome a challenge. Players can counteract this by being good gaming diplomats, but the problem still stands. Multiplayer aside, DKCR is a simple, albeit quite difficult, pleasure. The game could not be more appropriately titled, it as reminiscent of its predecessor as they come. So much so in fact, that the game feels too 'humdrum' to care about for long. PopMatters reviewer Arun rightly mourns no longer having the ability to switch between playing as Diddy instead of DK. I cannot help but wonder what sort of interesting mechanics Nintendo could have come up with had they not adhered so closely to the formula, regardless of how proven it is. I haven't played DKCR, so I can't comment on the strengths or weaknesses of its multiplayer. As you say, "bubbling" in NSMB is designed for "less skilled" players, which I think only really makes sense in context of what kind of multiplayer experience that Nintendo expected players to have in the game, that is (much like Super Mario Galaxy) a parent-child multiplayer experience. In that sense, Nintendo developed Wii software ocassionally feels to me to be not simply targeted "generationally" (in that, players of various age groups are catered to) but almost like games are often really targeted towards a Generation X audience specifically. The assumption in SMG (I think) is that a lot of its player-base grew up on Mario and now have kids of their own (which is a correct assumption) and that now they want to share that experience with kids. Seasoned players need a different challenge though than newbies born after 1990. The most fun that I have ever had playing any game with my kids was playing through SMG with my second youngest daughter (she was eight at the time). Allowing a skilled parent to control Mario, but keeping the little kid involved with the extra Wiimote works astonishingly well for the two targetted age groups. I have recommended this experience to other Dads in my age group and all report tremendously positive "bonding over gaming" experiences. Likewise, I played 4-player NSMB with my three daughters (ages 8-15) and my wife all last summer, and again, the handicap for age groups was just about perfect for two older old school Nintendo grown ups to play alongside three relatively unskilled Gen Y kiddies. My 8-year-old in particular really felt a part in a way that say other games that cater more (or can cater more) to a family audience (like the Lego games or Rock Band) usually don't allow her to. "Bubbling" does ultimately also provide a way of passing more difficult levels that require much more skill than even all the adults (or more seasoned gamers) in a room might possess (or sections that are just really not perfectly designed for multiplayer, which is the case at times in NSMB), but I still think that some of NSMB's design may make less sense with 4 "serious gamer type" players than it does when played as a family game. It seems just right to me at those moments. I bought DK Returns for my five year old for Christmas, figuring it would be a great little game to play co-op with him. Frustraiting. Thats all I can say. Frustraiting. I'll admit, I was overly harsh with NSMB. I think it's multiplayer is fantastic. After discussing the subject more with Scott and another emailer, I think of the problems are found in players' approaches (including my own). I think I'll have to return to the subject again soon. Ouch. I generally hate Lego games, but I might recommend that franchise as a more age appropriate selection for a five-year old. Alternatively, give him the hardest games you can find and turn him into a gamer that'll wipe the floor with your aging brain in just a few years.